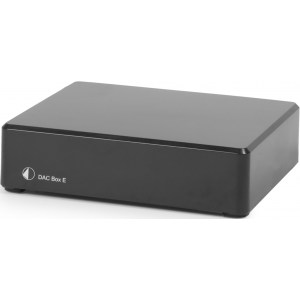 The Pro-Ject DAC Box E is an entry level digital and analogue converter for your digital sound sources. Delivering exceptional sound for its compact dimensions, the Pro-Ject DAC Box E uses high-quality components and still comes at a bargain price. The unit supports HD audio up to 24/192kHz. With a flawlessly linear internal circuitry design with low output impedance, the Pro-Ject DAC Box E works to prevent interference from cables or amplifiers. An ideal sound upgrade for most home entertainment systems, this portable DAC adds better sound quality for your CD player. BluRay/DVD player, Games console or set-top box.